Leisure Centre Cleaning, Gym Cleaning & Health Club Cleaning is important if you want to stay free of germs and disease and be fit at the same time. Professional Gym & Health Club Cleaning? Searching for a trusted contractor to assist your leisure centre cleaning services? ROSCA provide gym cleaning, health club cleaning and leisure centre cleaning at great competitive rates. We understand that your health club or leisure centre facility has particular needs in projecting an image of cleanliness. Go into a gym or health club and look around. People are using exercise equipment and machines, glistening with sweat, moving from machine to machine. Look closer and see the sweaty spots left behind. Gym and health club cleaning should include having spray bottles or sanitary wipes available during gym usage of machines. How many people use the spray bottles or sanitary wipes if they are left around to clean the machine behind them? It’s beyond just being inconsiderate and gross, it’s dangerous. Those inconsiderate people could be leaving infectious bacterias behind when they move on. But don't worry! ROSCA offers two basic maintenance packages to meet your cleaning and maintenance needs. Since we are locally owned and operated, we can adapt these packages to accommodate your individual cleaning requirements. The first impression of your facility is made at the reception desk. We pay special attention to areas that can escape the attention of other cleaning contractors. We use environmentally preferred cleaning products and equipment. Special odour-control products leave your facility smelling fresh and clean, not overly disinfected. There is high traffic in locker rooms and this area presents particular challenge in maintaining sparkling surfaces and controlling odour. In additional to our standard restroom maintenance program, we add an additional layer of odour control with metered aerosols that deliver 24-hour odour control. ROSCA provides regular maintenance of the stone and wood surfaces in sauna rooms with hydrogen peroxide-based cleaners that naturally deodorise, leaving surfaces clean and residue-free. 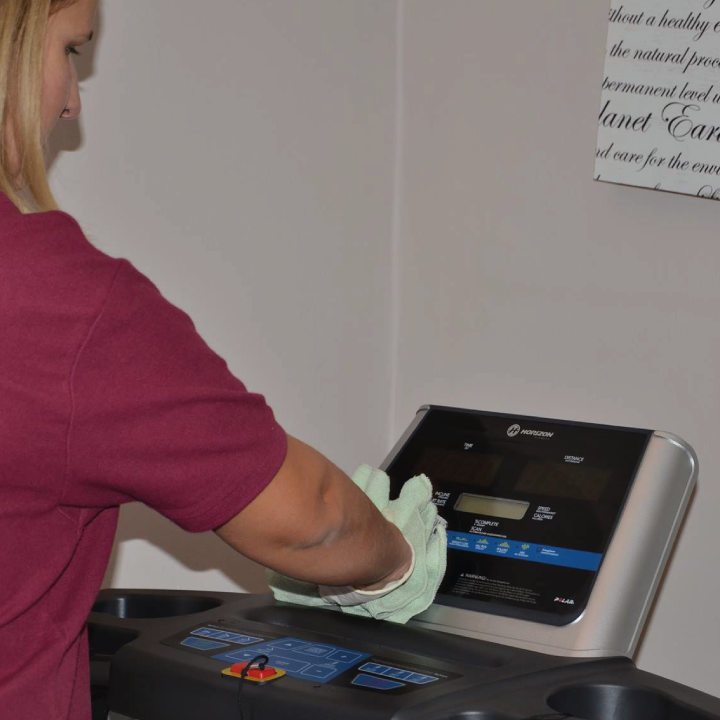 Members are assured that you have their personal health in mind when you have germicidal cleaners available for equipment wipe-down. We provide environmentally preferred products that will sanitise surfaces without damage. Additionally, our services include a sanitising wipe-down of exercise and yoga mats with an environmentally preferred sanitiser. Depending on the floor surface, we will use the appropriate bio-based floor cleaners to maintain class studio floors. We also have a great range of Janitorial Cleaning Supplies that will be helpful for you too. For a FREE no obligation quote please call Rosca on 0800 799 9149, or to enquire more about our fitness cleaning services please use our Contact Form.